X-Small - $56.99 Only 4 left! Small - $56.99 Only 1 left! Medium - $56.99 Only 4 left! Large - $56.99 Only 5 left! Welcome to Briarcliff Mental Institution! Not only do we house the mentally and criminally insane, but we also employ them. Would you like an application? If you're a nun possessed by the devil, then finding a job will be harder than getting into the gates of heaven. You can't even walk into churches without bursting into flames. Luckily, you will fit in great at Briarcliff and they'll be more than happy to hire you! The head nun has a penchant for cruel and unusual punishment and the main doctor enjoys experimenting on the patients. In fact, Dr. Arden releases his mutated former patients into the woods and now there is a whole community of them, hunting other people down. And to top it all off, the resident psychiatrist who is suppose to evaluate the patients, actually moonlights as a serial killer. When he isn't at Briarcliff doling out medication, Dr. Thredson is wearing a mask made out of flesh and holding women captive in his dungeon. See, your wickedness will be completely accepted and even celebrated inside the walls of Briarcliff! Dress up as a depraved nun to easily gain employment at American Horror Story's fictional mental institution! Win Dr. Arden and Dr. Thredson's approval by wearing this costume. 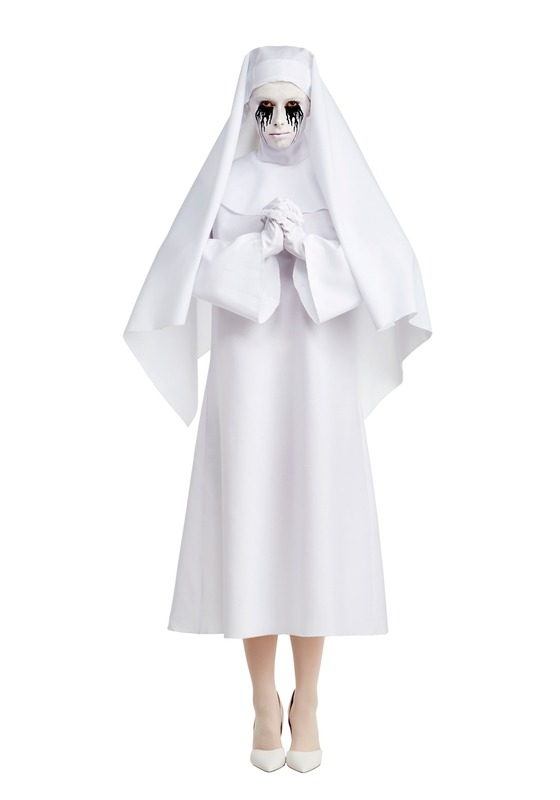 The White Nun deluxe costume will outfit you in an all-white dress, collar, gloves, and habit to recreate the promotional image from AHS season 2. Cover your face in white face paint and rim your eyes with black tears to get the complete look. Don't worry, Sister Mary Eunice will sense your evil nature and promote you in no time!